Details relating to the Finnish Commemorative of 2013. 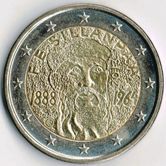 This coin honours the Finnish author Sillanpää. Sillanpää was the first Finnish writer to be awarded the Nobel prize for Literature. This was in 1939. He was awarded the Nobel Prize as his works showed a deep understanding of the Finnish peasantry and their relationship to nature. Two of his best known works are “Miehen tie” (A mans way) and “Nuorena nukkunut”(Silja, the Maid). He was also popular in Finland for his radio broadcasts and his Christmas columns. After the war he became a sort of grandfather figure in Finland (Taata) and his reading of Christmas stories over the radio became an immensely popular tradition. The motif of the coin is simply a life like presentation of Sillanpää within the inner circle. Around the top edge of the inner circle is the inscription “F.E.Sillanpää” . To the left and right of his face are years dates of birth and death – respectively 1888 and 1964. The year of issue is shown vertically between two and three o’clock. Finally, the mint mark can be seen at around seven o’clock. 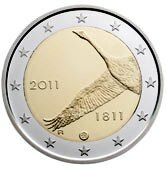 Return from Finnish Commemorative 2013 to euro coin collector.